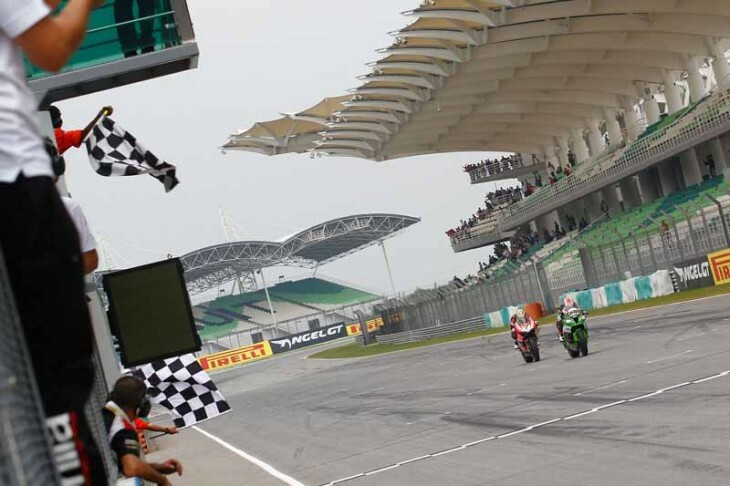 Championship leader Jonathan Rea (Kawasaki Racing Team) won the opening encounter at the Sepang International Circuit after a race of two halves, which saw Tom Sykes (Kawasaki Racing Team) slip to fifth at the flag after leading for the first eleven laps. The Ulsterman had a race-long battle with Davies that eventually came down at the last turn, when despite running wide the KRT rider was able to get on the gas early to retake the lead before the chequered flag. Rea’s twelfth race win of the season puts the Briton in a prominent position to clinch the title in Race 2 later on today; he would do so by gaining a further 11-point advantage to Sykes and, at the same time, by finishing ahead of Davies. Max Biaggi (Aprilia Racing Team) claimed a historic 71st podium finish in third, the Italian extending his own record of being the oldest rider to ever stand on a WorldSBK podium. Sylvain Guintoli claimed a season best fourth, after his Pata Honda appeared to be kinder to its tyres while Poleman Sykes dropped to fifth after setting a blistering pace that saw him shatter the lap record in the early stages. Alex Lowes was sixth aboard the Voltcom Crescent Suzuki ahead of Leon Haslam (Aprilia Racing Team), Althea Racing pairing Matteo Baiocco and Niccolo Canepa, and Jordi Torres (Aprilia Racing Team) who dropped from what looked like a safe fourth to tenth in the final few laps. David Salom (Team Pedercini), Randy de Puniet (Voltcom Crescent Suzuki), Leon Camier (MV Agusta Reparto Corse), Roman Ramos (Team Go Eleven) and Leandro Mercado (Barni Racing) completed the point scorers. Michael van der Mark retired his Pata Honda after running inside the top ten. Race 2 will start at 4.30pm local time and run once again over a duration of 16 laps at the 5.543km Sepang International Circuit.